Without winning three games, Eibar receives Rayo Vallecano, who is in the relegation zone, on Wednesday, April 3, in a match that is part of the schedule of the thirtieth round of the Spanish Championship in its 2018/2019 edition. The match will be played at the Estadio Municipal de Ipurua, in Eibar, starting at 3:30 p.m. (Brasília time). Enjoy the 22Bet welcome bonus of up to $ 600 for Brazilian bettors and increased refills every Friday!There are nine days left for the closing of the current LaLiga version. The tournament takes the top four places to the next season’s Champions League match of Europe. Whoever gets in the fifth and sixth places will have the opportunity to participate in the Europa League. The last three placed among the 20 participants are relegated to Second Division. Eibar’s fasting has two draws against Levante (2 to 2, away) and Alavés (1 to 1, away) and a defeat in circumstances similar to that of Wednesday’s meeting. The team took 2-1 at home to Valladolidas you can see on Now Goal, another team that is debating against the threat of relegation to the Second Division of the Spanish Championship, although it is in a slightly better situation than Rayo Vallecano .With 36 points (eight victories, 12 draws and nine defeats), Eibar started the thirtieth round dispute in eleventh place. Just like in the previous season, he came to flirt with the unprecedented achievement of a place in international tournaments, but he lost his breath.As principal, the performance of the team, despite the recent defeat for Valladolid, is much higher. When considering only the results of the teams in their domains, Eibar is the fifth placed in the LaLiga ranking. Of the 45 points played in his stadium, he had 26 (seven wins, five draws and three losses), scoring 26 goals and suffering 17.Coach José Mendilibar must have three restrictions to climb the team due to injury problems. The defenders are Anaitz Arbila (25 matches in the 2018/2019 edition of the Spanish league, one goal) and Pedro Bigas (ten matches, no goal); and midfielder Pape Diop (26 games, one goal). 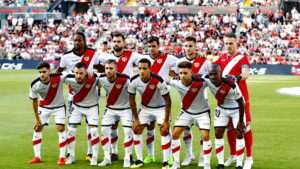 The Rayo Vallecano managed to stop on Sunday, March 31, a sequence of defeats that reached seven matches. But not with a victory. Acting at home, they were drawn 1 to 1 with Betis.He even came close to winning all three points. It left in advantage to the 34 minutes of the first stage with De Tomas. But it ended up yielding the equality in the 36 minutes of the second half. Tello scored. With that, he only reached 24 points (six wins, six draws and 17 losses) in the standings, remaining in the nineteenth – penultimate position. The difference for Villarreal, seventeenth and first team outside the region of the sticking, was of five points before the ball roll for the round of number 30.As a visitor, Rayo Vallecano’s performance is slightly higher. The team is the fourth worst in this matter in LaLiga. Of the 42 points played outside of their dominions, they have won ten (three wins, one draw and ten losses) having scored ten goals and suffered 22. The only injury loss for Wednesday’s match is due to be due to midfielder Gorka Elustondo (five matches in the 2018/2019 Spanish Championship without a goal). 1. Statistical data to be taken into account before playing Eibar vs Rayo Vallecano betting tips! It is a decent team, without any pretensions to the European places, but who has no emotions about relegation. At this point he is in the middle of the leaderboard, in 11th place. In 29 stages he scored 36 points, managing 8 wins and 12 draws, losing 9 times. He has a negative goal, scoring 38 goals, receiving two more. He ducks 3 games without success, losing with Valladolid, drawing with Alaves and Levante. It is very hard to beat home, where he only lost 3 times this season. He has a very weak season with emotions in terms of relegation. He is on the penultimate spot in La Liga, 6 points in 17th place. So far he has gained 24 points, scoring 6 wins and 6 draws, losing 17 times. He has a decent attack, scoring 31 times, but with the weakest defense in the championship, receiving 52 goals. He is victorious in the last 8 stages of the championship, losing 7 of them. 2. Latest information before Eibar vs Rayo Vallecano! He can not rely on Arbilla, who is injured, and Bigas is also uncertain. Cucurella will also be missing, being suspended. Elustondo will miss, according to the club’s official site, being injured. Di Santo is also suspended, so he will not play. 3. Eibar vs Rayo Vallecano likely teams. Eibar (4-4-2): Dmitrovic – Pena, Ramis, Oliveira, Cote – Jordan, Alvarez, Diop, Orellana – Charles, Enrich. Vallecano (4-2-3-1): Dimitrievski – Advincula, Amat, Ba, Moreno – Medran, Suarez – Bebe, Trejo, Garcia – de Tomas. 4. Eibar vs Rayo Vallecano latest direct info! In the last 5 direct defeats, there were two wins on each side. In the match of the Rayo Vallecano tournament he was forced 1-0 on his own. Although he has lost his last home game, Eibar has maintained great regularity throughout the season and standard performance good enough that the prognosis in his success against Rayo Vallecano is indicated as the best option for starting this Wednesday by the 30th round of the LaLiga 2018/2019. Eibar is a better team, undoubtedly, with added value. Also, in this dispute, they benefit from the advantage of their own land, where they do well. In this confrontation, however, the chest with the penultimate ranked, the team is in a weak form. So I expect in this dispute to witness the success of the host team, so I choose this bet, in a very good share, in which I am very confident. For a higher, but more risky stake, you can count on the fact that Eibar will score 2 to 0.